Two New England gun-making facilities will soon close their doors. The operations of both Bushmaster (Maine) and Thompson/Center Arms (New Hampshire) are being relocated to other facilities owned by their respective corporate parents. Smith & Wesson, parent of Thompson/Center Arms (T/C), is pulling the plug on T/C’s Rochester, New Hampshire operation. The Rochester factory will be phased out starting in January 2011, and finishing before the end of next year (2011). T/C production will be switched to Smith & Wesson’s Springfield, MA facility. Some workers may be relocated, but most will lose their jobs. According to S&W Mktg. Service Director Paul Pluff: “We needed to streamline in order to make our company more efficient and profitable.” S&W Human Resources VP Bill Lachenmeyer explained that the plant closure was due to a big decline in T/C sales over the last three years. S&W invested heavily in the new line of T/C Icon hunting rifles but the Icons didn’t sell well. Likewise sales of T/C’s signature Encore and Contender tilt-breech hunting pistols declined in the economic downturn. Click Here for T/C Factory Closure Report by Foster Daily Democrat. Share the post "Bushmaster and Thompson/Center Arms Factories to Close"
Many of the most popular powders sold under the Hodgdon brand in the USA (including Varget and H4350) are actually made by Thales Australia Ltd. (formerly ADI, Ltd.) in Australia. Some load manuals list Thales (ADI) data, but not Hodgdon data, or vice-versa, so we’ve compiled this list of equivalent powders. 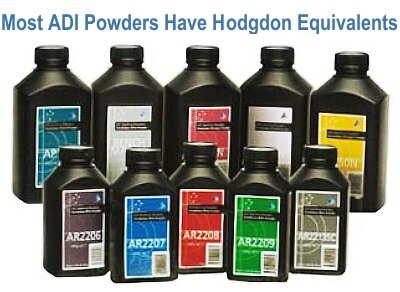 If you can’t find a recommended load for a particular Hodgdon powder in your caliber, download the latest ADI Smokeless Powders Handloaders Guide (2010, 5th Edition), a 5-megabyte Acrobat file. NOTE: Although new IMR 8208 XBR is made by Thales (ADI), Hodgdon has not published an ADI-equivalent product code. Thales has loaded some of the 8208 XBR into military ammo. However, Thales Australia Ltd. tells us: “[We] have yet to release the IMR 8208 XBR propellant in Australia to the sporting shooters market; thus it does not have an equivalent Thales (ADI) name”. Share the post "Hodgdon Equivalents for ADI Product Codes"